Carry all four bikes and tow a trailer with this tilting bike rack. Cushioning grips your bike frame as the top plate is tightened down. 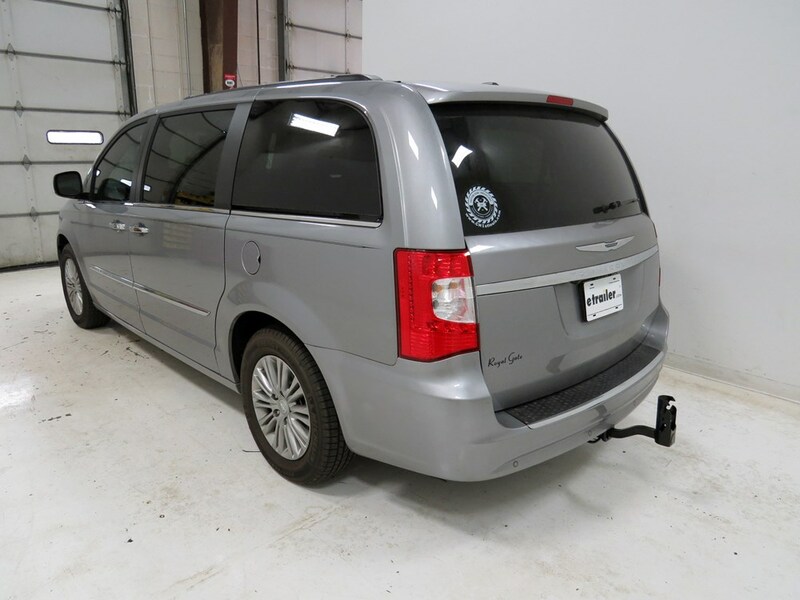 Install your hitch ball, lock the rack in the upright position, and you are ready to tow! 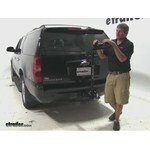 Call 800-298-8924 to order Swagman hitch bike racks part number S64675 or order online at etrailer.com. Free expert support on all Swagman products. 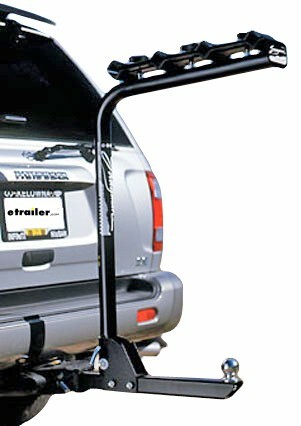 Guaranteed Lowest Price and Fastest Shipping for Swagman Original 4 Bike Towing Rack for 2" Trailer Hitches - Tilting. Hitch Bike Racks reviews from real customers. Carry all four bikes and tow a trailer with this tilting bike rack. Cushioning grips your bike frame as the top plate is tightened down. 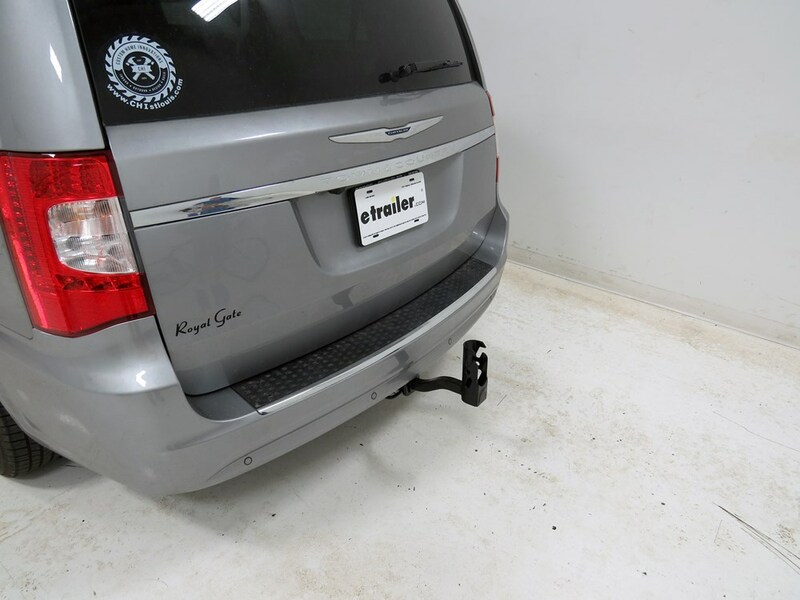 Install your hitch ball, lock the rack in the upright position, and you are ready to tow! 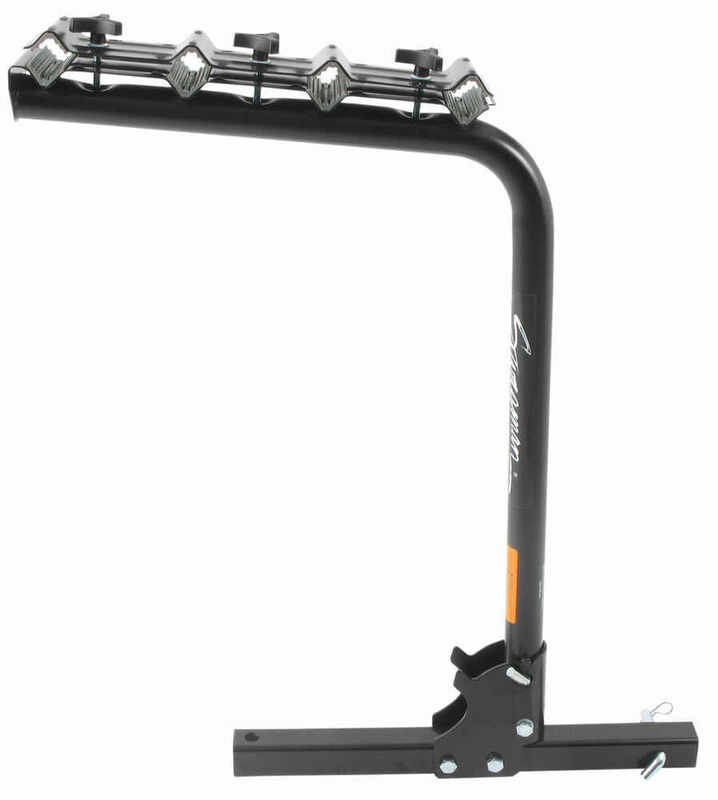 Distance between top of receiver tube to bottom of bike support: 32"
Note: A bike frame adapter bar (sold separately) may be required to mount certain bikes or keep your bikes level on the rack. Most women's, children's, or alternative frame bicycles will require a bike adapter bar. The simple design on this original four-bike rack offers riders basic carrier functionality. Its steel construction provides lasting toughness. Kraton vinyl cushioning helps protect frames and offers additional gripping power. The top plate accommodates several different frame sizes, and turning knobs secure bikes to the arm. 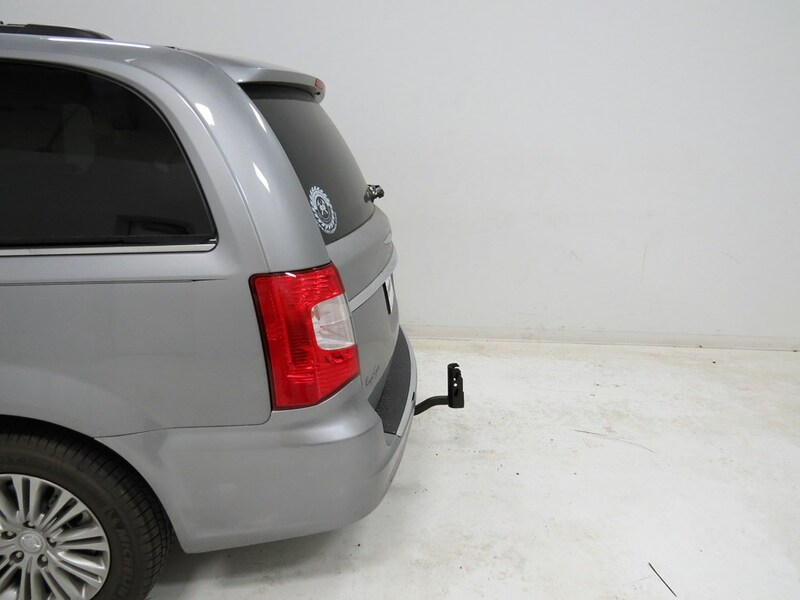 The rack tilts forward to allow easy access to the vehicle's rear cargo area. The rack has a towing capacity of 3,500 lbs. gross trailer weight and 350 lbs. tongue weight. This rack fits 2" trailer hitches. Each cradle contains grooved, kraton vinyl cushioning to offer additional gripping power and prevent bikes from sliding during transit. 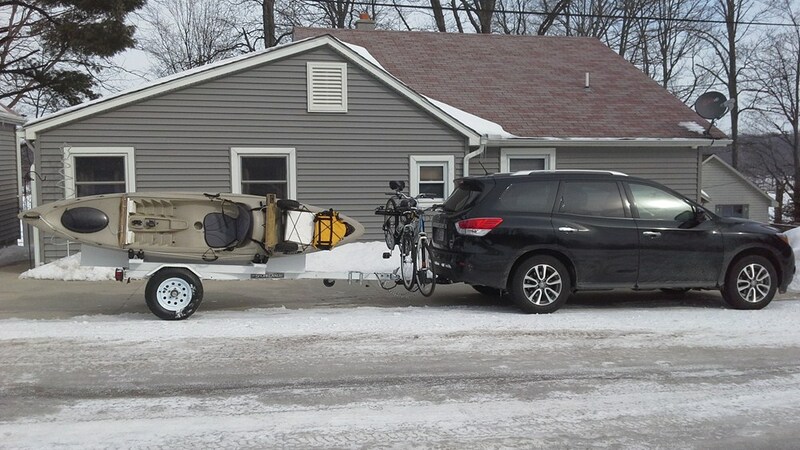 The Traveler Tow 'n Go lets you simultaneously transport 3 bikes and tow your trailer, camper or car with your hitch. Dual-arm rack slides over a 2" ball mount (sold separately) quickly and easily, and anti-sway cradles stabilize your bikes. 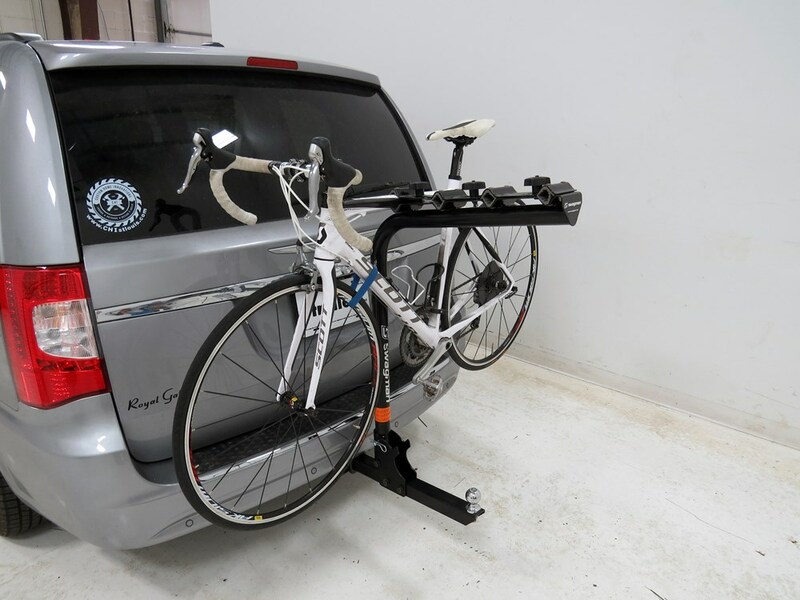 This rack swings away from the rear of your vehicle with bikes loaded for full cargo access. Easy-to-adjust cradles with ratcheting ZipStrip straps hold bikes securely on dual arms. Tool-free installation with locking knob. Includes cable lock. Today were going to be taking a look at the Swagman Original. This is a 3-bike towing style bike rack. Its been designed to slide on to two-inch ball mounts. The part number on the 3-bike configuration is S64600. We also have it in a 4-bike configuration and that part number is S64675. A great feature about this rack is its ability to actually tow your boat or your trailer or whatever you need to tow and still have room to transport three bikes with you. Pulling the top pin here will allow us to fold this away from our vehicle. As you can see in most applications, this gives us access into our rear cargo area. If we come up here to the top, well see that we have two black knobs. These black knobs are holding on our top plate. This top plate has three cradles that are built right into it. Each of these cradles are lined with a Crayton vinyl. This is going to offer us a great gripping strength onto our bikes, but it also protects those bikes finish. Here in the side, we do have a hole that goes all the way through. This can be easily secured after placing our bikes in with a padlock. We recommend the use of part number 131D. You can find that on our website. As you can see, we can accommodate a wide variety of frames, numerous sizes of frames with our top plate removed. We have this nice, strong, durable, black powder-coat finish that coats the entire rack force with the exception of where those cradles are of course and the handles. We can carry up to 35 pounds per bike onto the cradles and they offer you a limited lifetime warranty. Now that weve gone over some of the key features, let me show you how to install it on your vehicle. One of the requirements for ball mount that were going to have with using this rack is that from the ball or from the pinhole to the ball mount hole, we need to have a minimum of 10 inches. Today were going to be using part number 80232. We also recommend the use of part number 2736, 80233 or D-28. Our first step is going to be to slide our ball mount right through our rack, then I like to stick it right into the receiver tube to get it up off the ground and hold it in place for me. Now well go ahead and secure this with our pin. Our pin and clip are sold separately. You can find them on our website. Theyll be listed under part number PC3. Slide our pin through and well just secure it with our clip there. Now well bring our rack all the way to the back of our ball mount here. Now, a measurement that you may be interested in is the distance from the front of the rack to the rear of the rack. Its going to be about three and an eighth of an inch. Once we have this in position, were going to use a 14 mm wrench and well tighten down three bolts. As you can see here, we have got two on the bottom, one and two, and then come right over here to the right side youre going to see the third. Once we have the three of these tight, the rack is going to be secured firmly onto our ball mount. Were not going to have any play in that joint. As you can see, anytime youre using a ball mount and the standard pin and clip, you are going to have some wobble. Weve got a nice product that can really take care of that. Its a locking hitch pin bolt and it has an anti-rattle device built in. That part number is 63232. You can find that on our website as well. Now that weve got the hitch installed onto the vehicle, lets load up a bike. We want to remove our black knobs that are located on the top. This will allow us to remove the top cover. We can then grab our bike. Well place it right up on to the rack. Well replace our top cover and then well replace our black knobs back on and well thread them on down. Something you might be curious about since this is a solid top plate is its actually going to hold one bike in there securely. As you can see, its got a real firm hold. This top plate is made to be flexible so they can accommodate a very wide variety of frame types. Now that Ive shown you how the one goes on here, let me load up a couple more bikes. As you can see here, weve got the rack loaded down to capacity. Weve got our road bike, our mountain bike and our womens frame bike here. We did go with a bike adapter bar here in the ladys frame just to keep it sitting nice and level. If not, we have the rear end kicked up really high in the air. This is made by Swagman. Its part number is 64004. You can check that out on our website. Were now going to take the rack out through our test course so you can see exactly what it looks like in action. Well start by going through our slalom. This would be just like were changing lanes or making a few corners. Well go around the corner into our alternating bumps. Here well be able to see some torque being applied to the rack, so well see how its going to move side to side when we might hit a pot hole or a curb. As we go into our solid speed bumps, this will show us the up and down movement just like if we we're going in and out of our driveway, parking lot or parking garage, something of that nature. 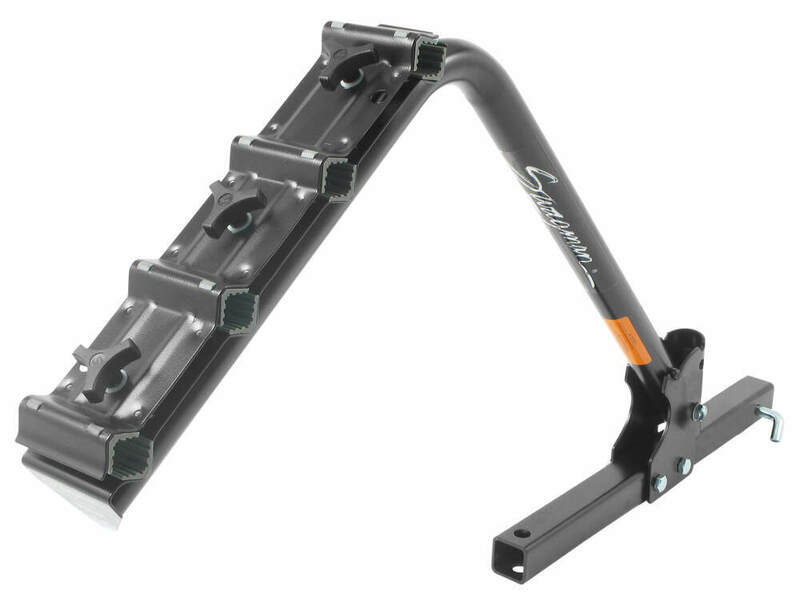 That will complete todays look at the Swagman Original Folding 3-Bike Towing Bike Rack for two-inch hitches part number S64600. .
Order: RelevanceNewestRating - High to LowRating - Low to High Carry all four bikes and tow a trailer with this tilting bike rack. Cushioning grips your bike frame as the top plate is tightened down. 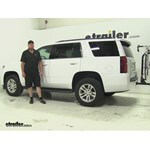 Install your hitch ball, lock the rack in the upright position, and you are ready to tow! Works great, Rachael. No problems to report, thanks. I used it to haul my bike down to Florida from Minnesota on the back of my RV. With the base being screwed tight to the hitch it traveled with zero problems. Very heavily built. Stores flat against the wall in the storage area underneath. I am extremely pleased with this product! $199.64. This is a 4 bike rack where the arms fold down for storage but the whole rack does not tilt down or fold. I agree that the cotter pin is weak. Doesnt seem right that it goes around the pin, instead of going through the pin. For what it is worth, we haven't seen around-the-pin clips fail any more than the throug-pin style. The nice thing about the around-the-pin style is that it can rotate and reduce the risk of bending the clip. With the through-pin, it is a lot easier to bend that clip. Some advice to anyone who may be using this rack. Please note that the weight limit is 35lbs. per bike. Always load the heaviest bike closest to the vehicle or trailer and the lightest bike on the cradle furthest from the vehicle. Had a bad experience with this product myself. Installed a trailer hitch on the back of my Fifth Wheel so I could use this rack. I put four mountain bikes on this rack and drove 145 miles. got out of the truck and the vertical bar had bent about five inches and bikes were all scratched up and heading for the pavement. product not strong enough for trailer usage. I see that one our customer service representatives has been in contact with you about this issue. If you have any more questions please feel to contact us. I still like this product. It has held up pretty well, and remains a budget-friendly rack that is easy to use. I definitely like how I can take it off the car and not have it be in the way when I am not hauling my bikes with me. However, I wonder if I would have liked a roof rack better - when you load this rack up with bikes on a very lightweight car it becomes a boat sail of sorts and not only kills your MPG, it creates a different feel to your car as you drive down the road in windy conditions. What held me back from going to a roof rack was that I didnt want a permanent fixture on the top of my car - and I still dont, but I still wonder if I would like that type of rack better. 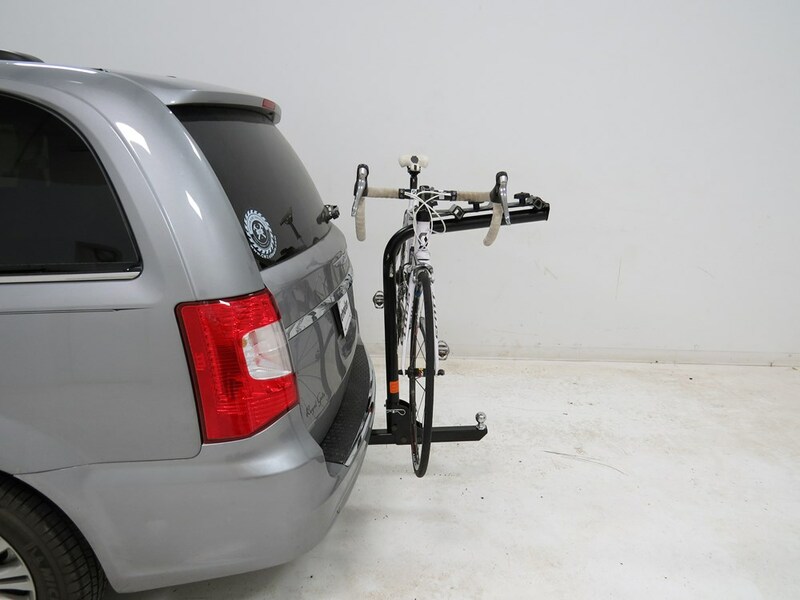 I am very happy to hear that you are pleased with your Swagman Hitch mounted bike rack. 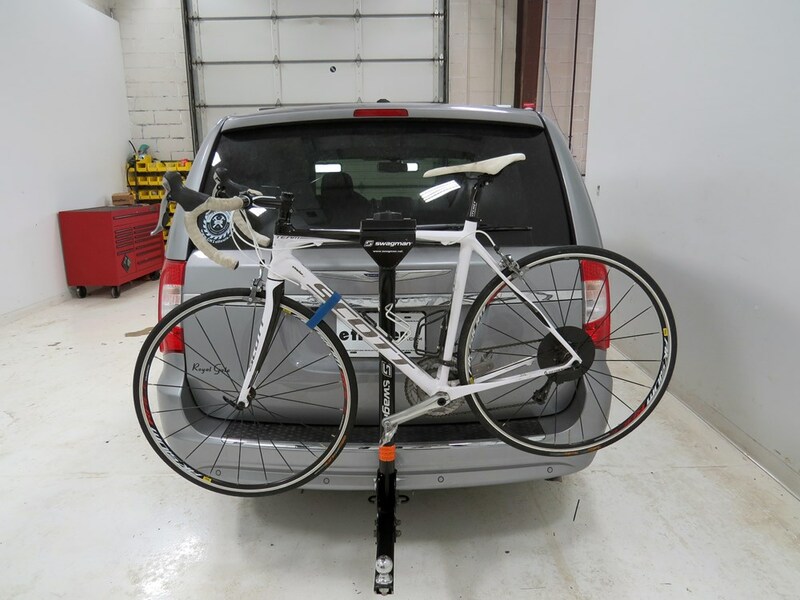 With the additional weight of the bikes loaded on the rack and on a smaller car it will make a difference in the handling, and it will have an decrease your MPG. However, using a roof mounted rack option is not as easy to remove (as you indicated), will also impact your aerodynamics and MPG. 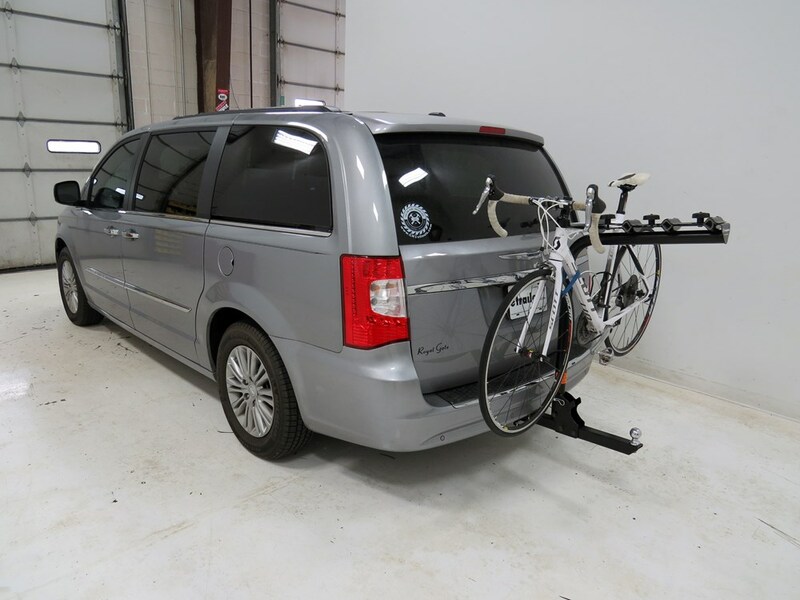 With the roof rack, and bikes loaded your mileage and handling will be significantly different (especially with crosswinds). Also, since you are carrying the bikes closer to the passenger area you will notice a significant difference in wind noise, even with the most aerodynamic bars, wind noise is still noticeable. I think your best bet is the hitch mounted bike rack option, but I would be happy to help you out if you need any other recommendations. 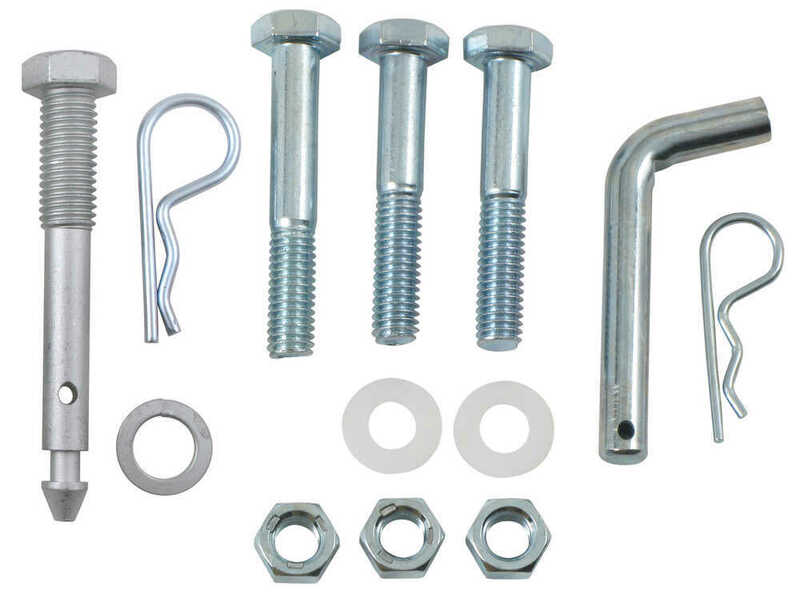 The locking hitch pin you will need for this bike rack part # S64152-2 is swagman threaded hitch pin lock part # S64027. This swagman bike rack does not tilt away for cargo access. 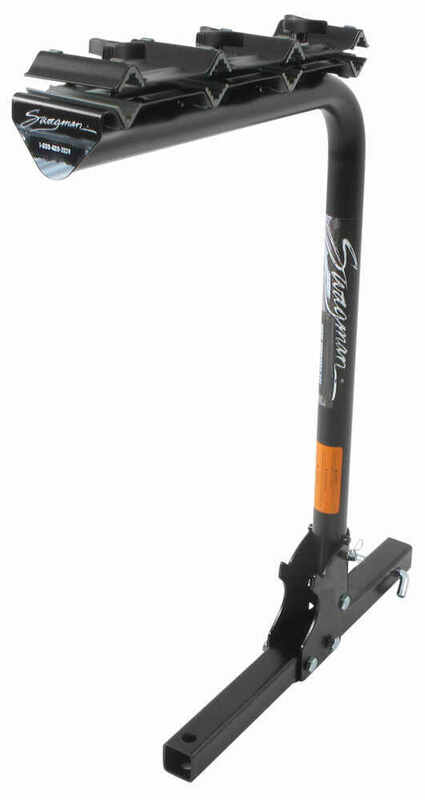 I recommend swagman trailhead hanging bike rack part # S63365 with the tilt away feature. 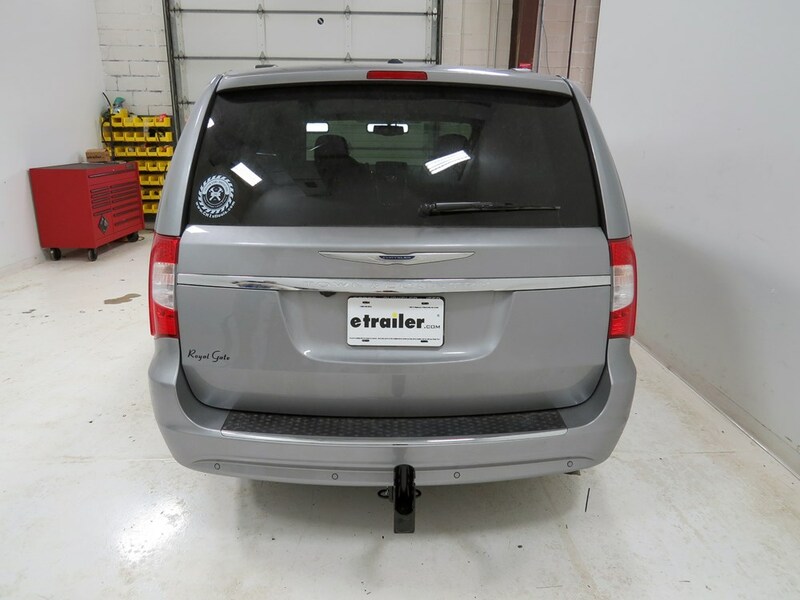 The trailhead tilts forward to allow easy access to vehicles rear cargo area. You will still need part # S64027 for the lock. $35.00 because it extends from 15 inches to 23 inches so it will work on adult womens bikes and childrens bike frames. 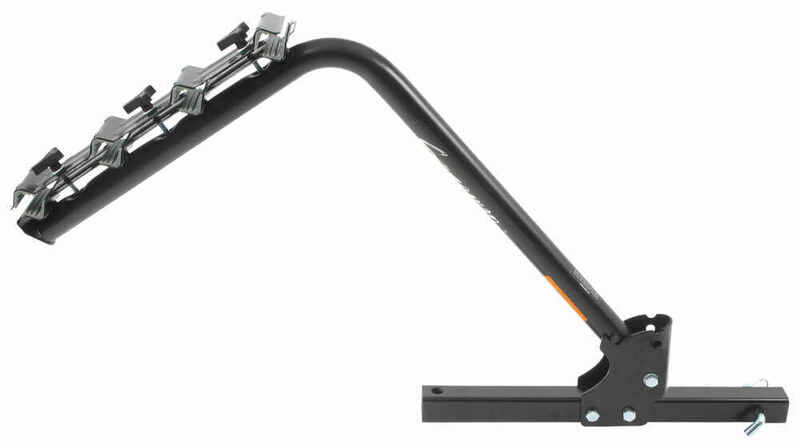 Can Swagman XP Hitch Mounted Bike Rack Replacement Cradle 64860 Clamp to Square Tube? 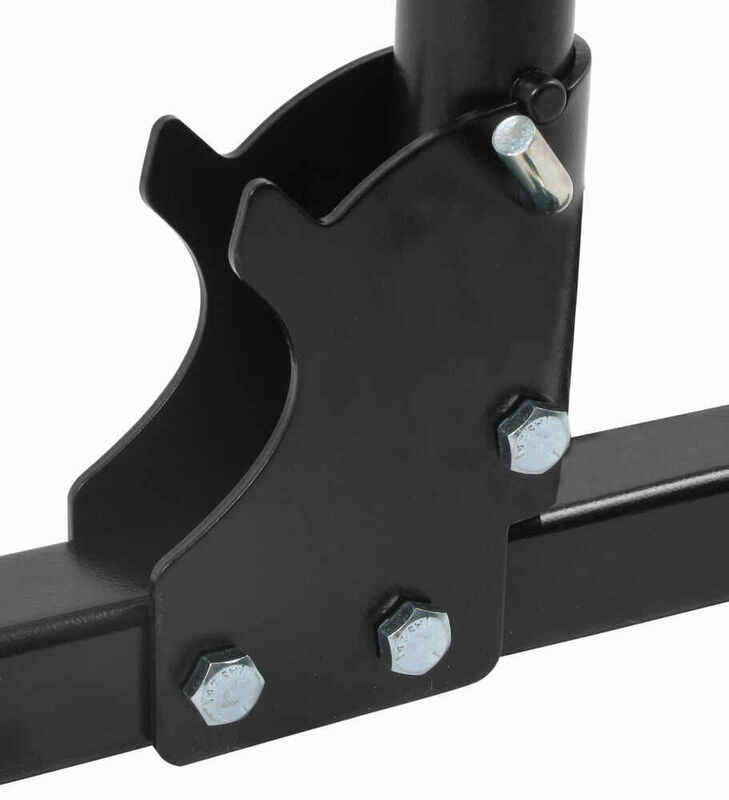 The U-bolt for this replacement cradle would only be stable on a round tube. I would recommend a bike rack that mounts on your ball mount instead of on your kayak trailer. You might try the 4-Bike Swagman # S64675. 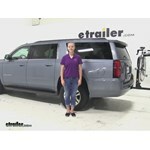 Another option is a truck bed rack or roof rack. I have included links to those products below.